The three day-long final conference of the „Mediation and Restorative Justice in Prison Settings” (MEREPS) project has been successfully carried out between 17th and 19th January 2012 by Foresee Research Group and the National Institute of Criminology. The three year long international research „Mediation and Restorative Justice in Prison Settings” (MEREPS) led by Foresee Research Group and the National Institute of Criminology has been closed. The MEREPS consortium includes six research groups from four European countries. The Hungarian-led project is headed by the Foresee Research Group, and operates under the professional leading of the National Institute of Criminology. Foresee’s foreign partners are the Leuven-based European Forum for Restorative Justice (Belgium), the London-based Independent Academic Research Studies (England), and two organisations from Bremen, the Hochschule für Öffentliche Verwaltung Bremen and the Bremen Mediation Service (Germany). The aim of the project was to investigate possible ways to implement mediation and restorative methods within the prison walls. The results of the Hungarian empirical research confirmed that the restorative approach and the implementation of constructive conflict resolution techniques could indeed work effectively in prison settings, as well. The final conference entitled „Responsibility-taking, Relationship-building and Restoration in Prison” summarising the findings of the study took place in Budapest between January 17 and 19 2012 organised by Foresee Research Group and the National Institute of Criminology, hosted by the Hungarian Judicial Academy with the participation of more than 120 Hungarian and international experts. At the conference, Dr. Tünde Barabás, Head of Departement at National Institute of Criminology and MEREPS project leader said that findings of the empirical research carried out in two prisons (Balassagyarmat – adult inmates, Tököl – juvenile offenders) involving both prisoners and prison staff show that although the any encounter between victims and offenders in prison settings is an especially delicate matter, it could bring about significant achievements both regarding the reintegration of the offender and the victims’ relief. Although the benefits of such encounter are clear, the involvement of victims after the sentencing is difficult due to current data protection regulations and the lack of victim support services providing mental support for victims of serious crimes. According to the results, victim-offender encounter can be recommended among adult inmates in cases where sincere repentance as motivation for the meeting can be identified from the part of the offender. Amongst juvenile offenders in the sample repentance and the need to ask for apology were less frequent presumably because of their age and socialisation deficits. For these inmates other types of reparation might be more adequate, such as working for the community, as an act of symbolic restoration. Dr. Borbála Fellegi, leader of the MEREPS project’s international consortium, executive director of Foresee Research Group held a report on the findings of a restorative pilot programme and the related action research in Balassagyarmat Prison, run by Foresee Research Group last year with the help of a psychologist and facilitator, Ms. Vidia Negrea. The conclusion of the research programme was that the restorative approach is, at present, most welcome and best used as a way of dealing with conflicts within the prison (so-called in-cell conflicts taking place between inmates) and as a way to strengthen prisoners’ relationship with their family members, especially before release. Numerous cases of the MEREPS pilot project have proved that mediation or other restorative interventions (restorative conferencing, for instance) led by a neutral third party (usually an external civil facilitator/mediator in pair with a trained prison staff member) effectively contribute to help the participants express their needs, interests and feelings and the offender take responsibility for their actions and help parties find a solution suitable for everyone. The three day-long final conference of the „Mediation and Restorative Justice in Prison Settings” (MEREPS) project has been successfully carried out between January 17. and 19. 2012. by Foresee Research Group and the National Institute of Criminology. On the first day of the professional programme, the participants visited the Balassagyarmat Prison, while the second and third day of the schedule was hosted by the Hungarian Judicial Academy. The event saw 120 participants, 22 international (American, Belgian Canadian, English, Finnish German Irish, Portugese, Romanian and Swiss) and more than 100 Hungarian experts.. A variety of professions were represented at the conference; alongside experts from the fields of prosecution, prison service, policy makers, victim assistance, researchers, psychologists, teachers, mediators and practitioners using restorative approaches were involved in great numbers as well. The main subject of the conference, the applicability of restorative methods in prison settings was, in the spirit of interdisciplinarity, discussed by several Hungarian and foreign experts representing various fields of expertise, introducing its several aspects during the three days. The attendants not only got a detailed introduction to the findings of the MEREPS project, but also a chance to get to know the latest theoretical trends and results from various Hungarian and international researches. There has also been emphasis on sharing experiences from Hungarian and international practices and the support of interactive professional dialogues as well. On the final day of the conference prison governors and other staff members gave an overview of the actual results and challenges. On the first day of the conference the participants received a free copy of the final publication, entitled „Responsibility-taking, Relationship-building and Restoration in Prison”, a book that summarizes the Hungarian and international findings of the MEREPS project. The book shall be downloadable for free from the www.mereps.foresee.hu website in both English and Hungarian from March 2012. On the final day of the conference, all of the participants received a certificate. The event started with a visit to the Balassagyarmat Prison, one of the main partners in the project. The 20 foreign and 15 Hungarian visitors were greeted in Hungary’s oldest prison by the governor, dr. István Budai who introduced the history and everyday life of the prison and gave an overview of finished and ongoing projects aimed at improving inmates’ quality of life, reintegration and communal atonement. The visitors had a chance to see the inmates’ cells, study rooms and a pottery class as well, where they were gifted with candle-holders made by the inmates themselves. An especially memorable moment was the visit to the prison chapel, where the murals were painted by the inmates themselves, guided by a civilian painter as a result of a successful initiative. The inmates, directed by piano-artist Ádám Fellegi put on a moving rock-opera performance inspired by the biblical story of the Good Samaritan. The Biblical story was explained to the audience before the performance by the American guest of the conference, Rev. Jerry Hancock. The text of the Rock-opera, written by an inmate, Dezso Gagyi and Adam Fellegi can be downloaded from here. The first day of the professional programme was opened by one of the visionaries of the MEREPS project, executive of Foresee Reasearch Group, Dr. Borbála Fellegi, who, together with Dr. Tünde Barabás developed the basics of the project in 2008. The opening speech was followed by greetings from András Csóti, deputy commander of the Hungarian Prison Service, and Dr. Gergely Bánhegyi, director of the Hungarian Judicial Academy. First in line of the presentations was the one by Prof. Alison Liebling, criminology professor of the University of Cambridge. 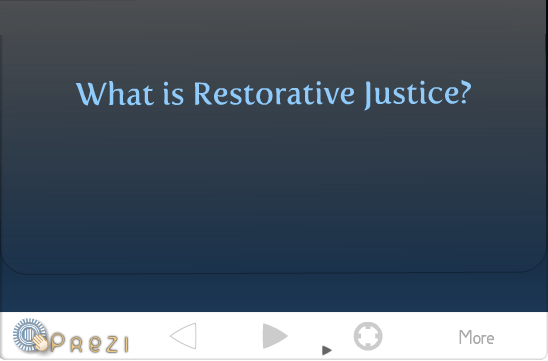 The professor summarized the findings of her decade-long prison research, affirming the legitimacy of restorative objectives. The findings of the MEREPS project were the subject of the first round table discussion, chaired by Karolien Mariën (European Forum for Restorative Justice). The English findings were summarized by Dr. Theo Gavrielides, executive of Independent Academic Research Studies, the German execution was introduced by Prof. Arthur Hartmann (Institute for Police and Security Research, Hochschule für Öffentliche Verwaltung), while Dr. Tünde Barabás and Dr. Szandra Windt from the National Institute of Criminology presented the Hungarian findings. The presentation of Prof. Alison Liebling can be downloaded from here. The presentation of Dr. Theo Gavrielides can be downloaded from here. The presentation of Prof. Dr. Arthur Hartmann can be downloaded from here. The presentation of Dr. Tünde Barabás and Dr. Szandra Windt can be downloaded from here. The attendants could choose between two workshops in the afternoon of the first day. The international workshop, chaired by Dr. Theo Gavrielides discussed the implementation of restorative justice and mediation in prison The interactive workshop gave an overview of various international practices, legal backgrounds, trends and challenges through questions asked by the audience. Prof. Arthur Hartmann gave an introduction to the German, Ms. Karolien Mariën the Belgian, Dr. Theo Gavrielides the English and Tania R. Petrellis the Canadian restorative practices, while reverend Jerry Hancock introduced an American program, sharing the findings of Prison Ministry Project. The workshop was a great opportunity for Hungarian experts to get first hand information about experiences of those working on the international restorative field There also was discussion about the role of the community, the location of the victims and the challenge of sustainability in restorative processes. The other afternoon workshop, „Good practices, shared experiences in the Hungarian Prison Service”, led by János Wágner expected those Hungarian and foreign attendants who wanted to learn about Hungarian restorative programs, practices apart from the MEREPS project. Ildikó Batizi, representing the Ministry of Interior summarized the results of the TÁMOP-5.6.2-10/1-2010-0001 EU-funded project, connected to the subproject entitled „ Creating a multi-phase, social and labour market reintegration, an intensive after-care models for convicts,”.. Dóra Szegő, representing Foresee Research Group gave an overview of the MEREPS experimental prison mediation pilot’s findings from the researcher’s point of view. In the end János Wágner, mediator of Partners Hungary summarized the findings and long-run results of the mediation training held in 8 prisons. The presentations were followed by interactive discussion. One of the main topics was the prison service judges’ stressed the need of psychologists and other social service practitioners inside the prisons. Numerous topics of the practical side of mediation inside prisons were also talked over, for example: who could provide mediation inside a prison and what would be the appropriate conditions that need to be met in order to realise truly restorative processes within the prison. The presentation of Ms. Karolien Mariën can be downloaded here. The presentation of Prof. Arthur Hartmann can be downloaded here. The presentation of Ms. Dóra Szegő can be downloaded here. The presentation of Ms. Ildikó Batizi can be downloaded here. The presentation of Mr. János Wágner can be downloaded here. The emotional peak of the day was the presentation of the English journalist, Marina Cantacuzino. After a short film used as an introduction, she spoke about her work with inmates in the organization called The Forgiveness Project, a project that works with victims, relatives and perpetrators of extremely serious crimes (manslaughter, terrorism, etc. ), looking for a chance for forgiveness and peace among those involved. The way Marina Cantacuzino explained in her presentation: forgiveness is mainly a help for ourselves, not for the other…a help so that the weight of the tragedy of the past won’t crush our present and future. In her words: „Forgiveness means giving up all hope for a better past” The coordinator of the session, Vidia Negrea (IIRP trainer, KIMISZ victim assistant psychologist) encouraged the attendants to join together in small groups and discuss the importance of forgiveness in the restorative practices and their own lives. This interactive session provided an interesting time for exchange amongst the different participants about their everyday work and thoughts concerning the role of forgiveness. The closure of the first day was “celebrated” with a very special cultural programme. After a long day of mental adventures, the concert of the authentic Roma band, Terne Prhala from Csobánka (a little village near to Budapest) touched the participants’ hearts with great success. The five family members who were playing and dancing could show the emotional side, the sorrow and joy of the Roma people through their very genuine music. The further improvement of professional bonds was continued during the conference dinner. The final day of the conference focused on professionals working in the Prison Service. The forenoon plenary, chaired by the president of the Restorative Justice Section of the Hungarian Society of Criminology, Dr. Erzsébet Hatvani, started with reports from two experienced trainers of the Hungarian project. Dr.Marian Liebmann, restorative expert, mediator, trainer and researcher from the United Kingdom, who held a three day-long mediation training before the start of the pilot mediation project for the staff of the Balassagyarmat and Tököl prisons gave an all-round international overview of the multiple ways restorative techniques are used in the various countries of the world. Vidia Negrea, victim assistant psychologist of KIMISZ and restorative trainer assisted the work of the MEREPS project in the Balassagyarmat Prison as a trainer, mediator and supervisor. In her presentation, she exhibited the findings and challenges with her usual credibility and professionalism. The presentation of Dr. Marian Liebmann can be downloaded here. The presentation of Ms. Vidia Negrea can be downloaded here. The invited presenters of the forenoon roundtable were directors and staff of prisons involved in the MEREPS project, experts, who were able to share a first-hand impression of the project from a prison service point of view. The moderator of the plenary was Dr. Tünde Barabás, researcher of the National Institute of Criminology and MEREPS project leader. As a preliminary to the discussion, the short film of the English victim assistant group „Why me” was screened to the audience. In the film, the founder of the organization, Will Riley shares a story about how he became a victim of breaking and entering. What’s special about the film is that Will tells the story together with the offender, Peter, whom he first met on a restorative conference, and later was inspired by this meeting to bring his organization to life. After the film, dr. István Budai, governor of the Balassagyarmat Prison, Mihály Kovács, head of department held their presentations. The governor introduced the prison and gave an overview of finished and ongoing projects aimed at improving inmates’ quality of life, reintegration and communal atonement, while Mr. Kovács shared the experiences and challenges of the MEREPS project in their prison. Tamás Tóth, commander of the Tököl Prison for Juvenile Offenders introduced the prison, then shared his experiences with the project, and also shared some personal experiences related to the conference’s subject. At the end of the roundtable, the attendants had the chance to ask the prisons’ representatives questions related to carrying out the project. Based on the statistics from the presentations, as well as the prison service experts’ personal opinions, it is safe to say that in general, the application of restorative techniques has a definitive role in lessening the conflicts in prisons, and both commanders emphasized the beneficial effect of involving civilian experts. The presentation of dr. István Budai can be downloaded here. The presentation of Mr. Mihály Kovács can be downloaded here. The last event of the conference, chaired by the organizer of the conference, Dr. Borbála Fellegi, was carried out with most of the attendants from the afternoon plenary present, and with great interest. The first presenter was Attila Szarka, director of the Aszód Juvenile Institution. He introduced the particularities of juvenile offenders, and with his help the audience had the chance to follow the journey of a conflict within the institute through the example of an actual case. The final presentation of the conference was held by Prof. Dr. Péter Ruzsonyi, university professor of the National University of Public Service, Faculty of Law Enforcement. His presentation was a summary of possible ways for restorative practices in prisons. At the end of the three day-long conference, the attendants had a chance to give feedback, not only in writing, but staying true to the event’s interactive spirit, in speech as well. The members of the numerous audience worded their personal and professional reflections as well in the conference-closing circles. The presentation of Prof. Dr. Péter Ruzsonyi can be downloaded here. Although the metaphor about “squaring the circle” and “sphereing the triangle” became a guiding symbol for the conference, referring to the many challenges in implementing the democratic and equality-based restorative approach into the hierarchy-based prison setting, the participants agreed that applying these techniques within prison walls is necessary as well as useful. The findings of the MEREPS research and experimental pilot program showed, that it is essential to give help the prison staff so that they may be able to use not only the traditional „reward-punishment” system while trying to forward the responsibility taking and understanding of inmates, but – as a third way – other, restorative techniques as well. Prison staff in Hungary is overburdened and experiencing a constant lack of resources. This makes the use of techniques that find solutions for easing tensions and handling conflicts in a peaceful and co-operative way highly important. Written feedback from the participants confirm that the conference provided a unique opportunity for familiarizing and sharing Hungarian and international experiences, bringing together the professions involved, jumpstarting the discussion and collective thinking. According to the results of the questionnaires, 82 percent of the participants answered that they acquired new information, and the satisfaction rate concerning the program and the organizing was 98 percent. The Hungarian participants mentioned in great numbers the chance to be introduced to the international experiences and the fact that the conference put emphasis on the practice as well as the theory as one of the main benefits. Among the conference’s mentioned strong points were: „ the multi-aspect approach, the multi-level familiarization of those involved” (student), „provided help for cases that seemed so far insolvable” (judge), „information on family group conferences” (judge), „information on work with the victims” (representative of civilian organization, probation officer), „practical advices and experiences” (prison service), „building connections” (mediator). Many of the attendants emphasized that the conference had motivational, inspirational, or affirmative effect on them. We would like to wish all our participants good luck and many personal and larger successes in further developing the restorative approach in their daily work, and hope that the relations that were established during this conference will be fruitful for everyone in the future, too! The full programme of the conference can be seen here. Photos of the conference can be seen from here.